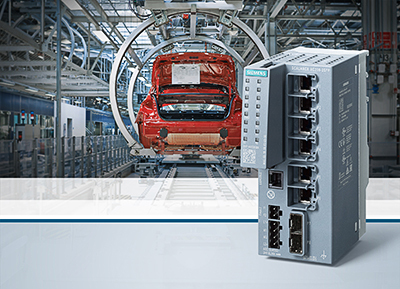 With its Scalance XC-200 product line, Siemens is bringing a generation of compact Industrial Ethernet switches onto the market. Users can use them to set up electrical and optical line, star and ring structures in industrial networks. The layer 2 network components can be integrated into both Profinet and EtherNet/IP diagnostics. The switches are characterized by their high number of ports and connections, a temperature range of -40 to +70 °C as well as approval for hazardous areas (ATEX Zone 2, IECEx). As a result, they can be used in such areas as mechanical engineering, transportation, and in the automotive or oil and gas industry. For transferring large volumes of data, Siemens offers the Scalance XC206-2SFP switch with two Gigabit ports. Users can use this to transmit video data, for example, from tunnel cameras to a control center. The Scalance XC-200 devices are available in different versions with up to 24 RJ45 ports and two ST/BFOC or two SC ports. With the Scalance XC206-2SFP, users can select two ports. Depending on what is needed, fiber-optic SFPs are used for single mode with a maximum range of 200 km or for multi mode with a range of up to 5 km. All of the devices are equipped with a redundant power supply. It enables operation even if one power supply system fails. The housing and the collars combined with the FastConnect connectors and cables ensure RJ45 connections in environments in which equipment has to endure shock and vibration. Due to their design, user can mount the managed Industrial Ethernet switches on the wall, on a 35 mm DIN rail, or on a Simatic S7-1500 mounting rail. Clearly arranged diagnostic LEDs and a signaling contact enable precise determination of the state of the equipment as well as diagnostic evaluations. The Fiber Monitoring function, which is integrated in all Scalance XC-200 with a fiber-optic connection, continuously monitors the fiber-optic cables. It warns the user when the cables become old or impure. Additional functions such as Link Aggregation and Remote Network Monitoring (RMON) round out the firmware range of the Scalance XC-200 line of products. This entry was posted in CAD-CAM-CAE, Featured News on November 11, 2016 by Sharmila Guha.